Glendale values safe streets and a sense of security, well-maintained landscaping, community-specific installations, being family-friendly, and having a range of amenities, programs and spaces in the neighbourhood. Residents outlined what was important to them, focusing on the themes of people, places, programs and possibilities. The City then worked with residents to identify projects that would support the vision and be possible in their neighbourhood, and then residents prioritized the projects. Neighbours will enjoy a safe, clean and green neighbourhood through these new programs. Residents will have more recreation opportunities, create gardens, and plan special events, as well as creating a neighbourhood watch program. The following is a summary of programs, services and/or small-scale infrastructure improvements the City of Calgary will implement in partnership with residents of Glendale. Low maintenance botanical gardens in traffic circles - Currently in the design and development stage. Scheduled to be installed Spring/Summer 2018. Additional bike paths -We heard that residents would like to see bike paths in the community extended. Pathway and Bikeway Map - This mapping system shows real time updates on capital and operational work on our pathways. The requested section of pathway within your community will be added to The City’s "Missing Link Wish-list". This list determines the value of a potential pathways through the area for formalization, based on connectivity, potential frequency of use, value to the community and other factors. The request will be further evaluated if and when funding becomes available. Traffic calming measure on 19 Avenue S.W. - The traffic study process begins once a community or individual location is identified as the highest priority according to the evaluation process, and is described in more detail in the . City staff will work with the volunteer community traffic committee to determine the most appropriate traffic calming measures to address the identified concerns. Learn more about the traffic calming process . 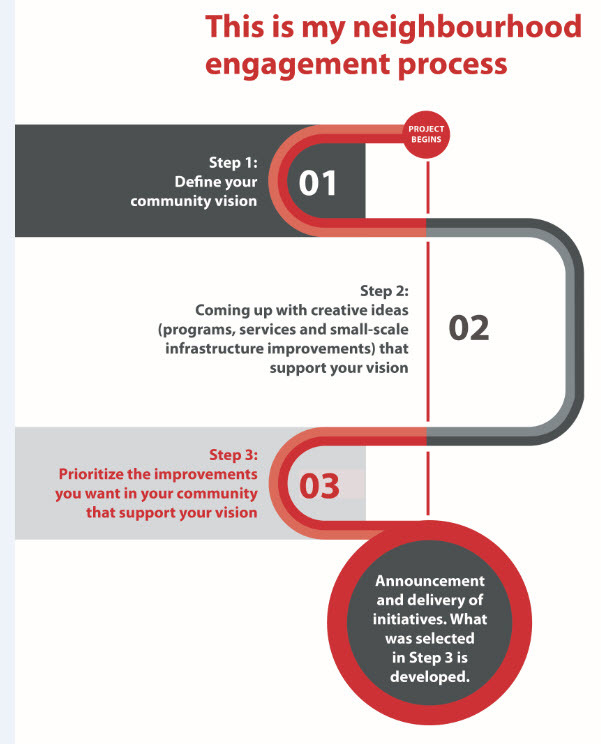 The report of what we heard when Glendale residents prioritized initiatives created at the idea workshops to make their vision a reality is available here. The report of what we heard during the Glendale idea workshops is available here. The vision statement for Glendale is: Glendale values safe streets and a sense of security, well-maintained landscaping, community-specific installations, being family-friendly, and having a range of amenities, programs and spaces in the neighbourhood. After working with residents and City staff to come up with ideas for possible initiatives, we asked for your input on which of the following initiatives would have the most impact on achieving the neighbourhood vision. This engagement was open for input in March 2018. Development of a "park bench theme" to work with residents to design and install themed benches along a walking route within the community. Open fire hydrants for kids to play at a temporary splash park. This allows neighborhood children an opportunity to connect and play, while adding vibrancy to local neighbourhood life. A beautification plan for the pedestrian bridge and/or Optimist park entrance. Subject to a feasability study. The development of a marketing plan for the Community Association will inform a community identity and/or brand as well as to support residents to be better informed and engaged. This can result in more connections between the community association and residents for better delivery of programs and services. A community garden encourage people to come together and enjoy community life. We would need community support to make this initiative happen. If you would be interested in volunteering to help, be sure to answer the Volunteering question below and make sure you've signed up for email updates. Work with the community association and affected stakeholders to launch/re-launch a Community safety watch and/or crime prevention program. An artist would work with the community to develop public art such as a mural, flags and banners or utility box painting. Public art contributes to the beautification of the neighbourhood. Residents enjoy their public spaces more and feel a greater sense of community pride and connection when they view the artwork they influenced. Work with the local schools and other stakeholders to engage in the design elements for a "new turtle" to ultimately be constructed and re-installed at Turtle Hill. Event opportunities bring people together and provide an opportunity for neighbours to connect, be active and have fun while building upon their sense of involvement in a vibrant neighbourhood. Residents are encouraged to complete acts of kindness and share on social media. This could include ideas such as helping neighbours with yard work, pick up garbage in the neighbourhood, etc. We would need community support to make this initiative happen. If you would be interested in volunteering to help, be sure to answer the Volunteering question below and make sure you've signed up for email updates! If you are interested in volunteering to support the initiatives below that will help us gauge interest to know if the program should go forward. Please choose the initiatives you would be interested to support (check all that apply). Then be sure to click the link below and sign up for the email updates and watch for emails that ask for volunteer support. From July 10 to October 31 we asked residents in Glendale: what would make Glendale a better place to live, work and play. They were then asked to choose their top three vision words from a list of word, or add their own, and explain why they chose that word. The full report of what we heard during this engagement can be found here. Based on all the feedback, three vision statements were created for Glendale and we asked you to tell us which vision statement you like best. See below for results. This vision will be used in the next step of the engagement when we work with you to come up with initiatives. Which vision statement do you like best? Glendale values being a safe, beautiful and family-friendly neighbourhood. Glendale values safe streets, community action, on-going beautification efforts that contributes to community pride, and upgraded amenities, programs and spaces for all ages that help to maintain and promote being a family-friendly neighbourhood. In the first round of engagement, we asked the following question. What would make Glendale a better place to live, work and play? Choose your top three vision words from the list below, or add your own, and tell us why. How did you hear about this engagement opportunity?